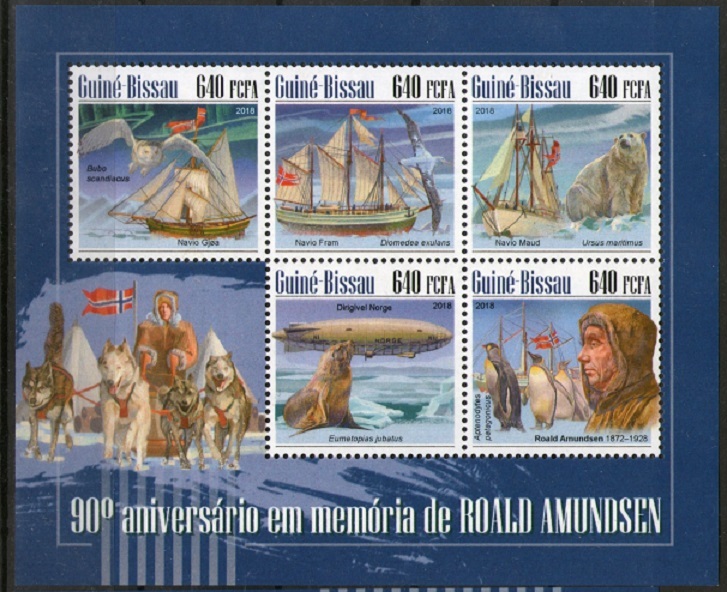 shipstamps.co.uk • View topic - Roald Amundsen. Travels and discoveries. Roald Engelbregt Gravning Amundsen, (born July 16, 1872, Borge, near Oslo, Norway—died June 18, 1928?, Arctic Ocean), Norwegian explorer who was the first to reach the South Pole, the first to make a ship voyage through the Northwest Passage, and one of the first to cross the Arctic by air. He was one of the greatest figures in the field of polar exploration. 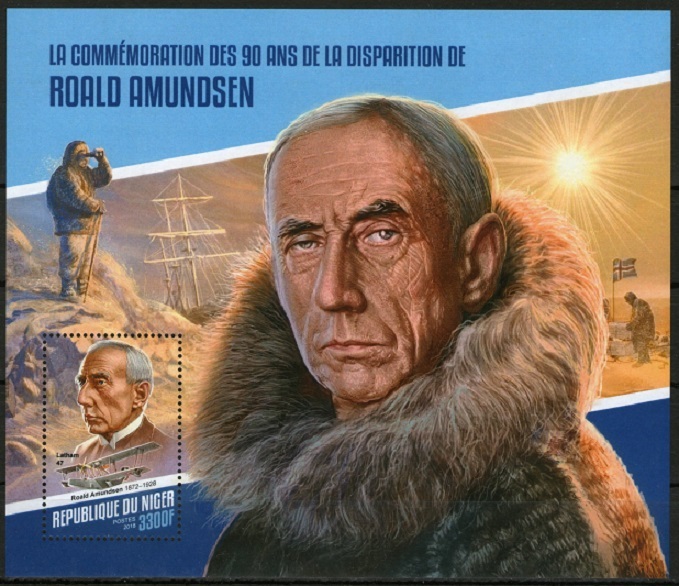 Amundsen studied medicine for a while and then took to sea. 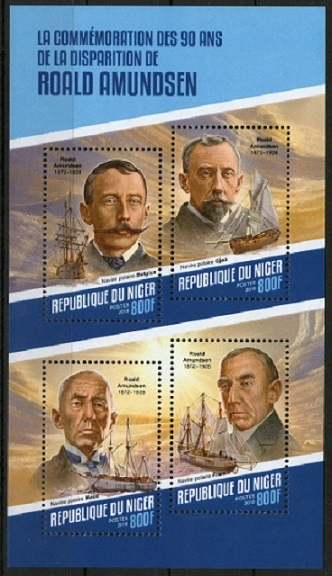 In 1897 he sailed as first mate on the Belgica in a Belgian expedition that was the first to winter in the Antarctic. 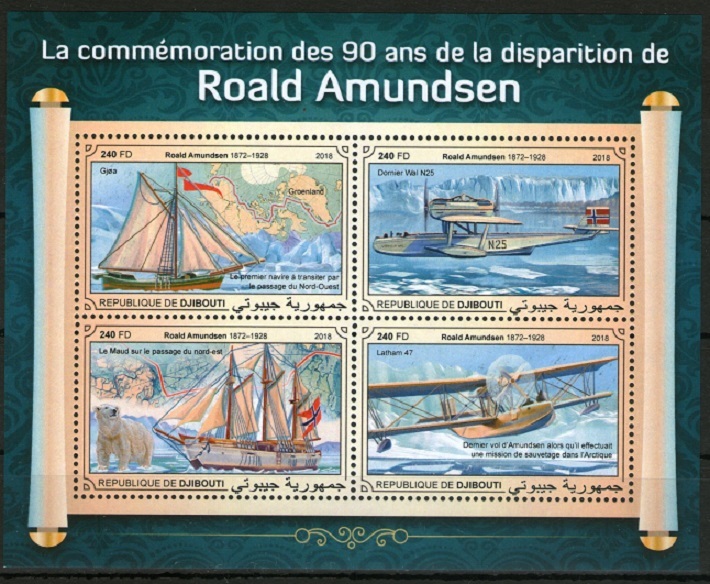 In 1903, with a crew of six on his 47-ton sloop Gjöa, Amundsen began his mission to sail through the Northwest Passage and around the northern Canadian coast. He reached Cape Colborne (in present-day Nunavut) in August 1905, completing his transit of the passage proper, before ice halted his westerly progress for the winter at Herschel Island in the Yukon the following month. Amundsen and his crew resumed the journey in August 1906 and were greeted with a heroes’ welcome when the expedition concluded in Nome, Alaska, later that month. This achievement whetted his appetite for the spectacular in polar exploration. Amundsen’s next plan, to drift across the North Pole in Fridtjof Nansen’s old ship, the Fram, was affected by the news that the American explorer Robert E. Peary had reached the North Pole in April 1909, but he continued his preparations. When Amundsen left Norway in June 1910 no one but his brother knew that he was heading for the South Pole instead of the North. He sailed the Fram directly from the Madeira Islands to the Bay of Whales, Antarctica, along the Ross Sea. The base he set up there was 60 miles (100 km) closer to the pole than the Antarctic base of the English explorer Robert Falcon Scott, who was heading a rival expedition with the same goal. An experienced polar traveler, Amundsen prepared carefully for the coming journey, making a preliminary trip to deposit food supplies along the first part of his route to the pole and back. He used sled dogs to transport his supplies. Amundsen set out with 4 companions, 52 dogs, and 4 sledges on October 19, 1911, and, after encountering good weather, arrived at the South Pole on December 14. The explorers recorded scientific data at the pole before beginning the return journey on December 17, and they safely reached their base at the Bay of Whales on January 25, 1912. Scott, in the meantime, had reached the South Pole on January 17, but on a difficult return journey he and all his men perished. With funds resulting from his Antarctic adventure, Amundsen established a successful shipping business. He acquired a new ship, the Maud, and tried in 1918 to complete his old plan of drifting across the North Pole, but he was forced to abandon this scheme in favour of trying to reach the North Pole by airplane. In a flight (1925) with the American explorer Lincoln Ellsworth on 2 «Dornier Do J», N-24 and N-25l flying boats, he did not fly 150 miles (250 km) to the pole. In 1926, with Ellsworth and the Italian aeronautical engineer Umberto Nobile, he passed over the North Pole in a dirigible «Norge» , crossing from Spitsbergen (now Svalbard), north of Norway, to Alaska. Disputes over the credit for the flight embittered his final years. 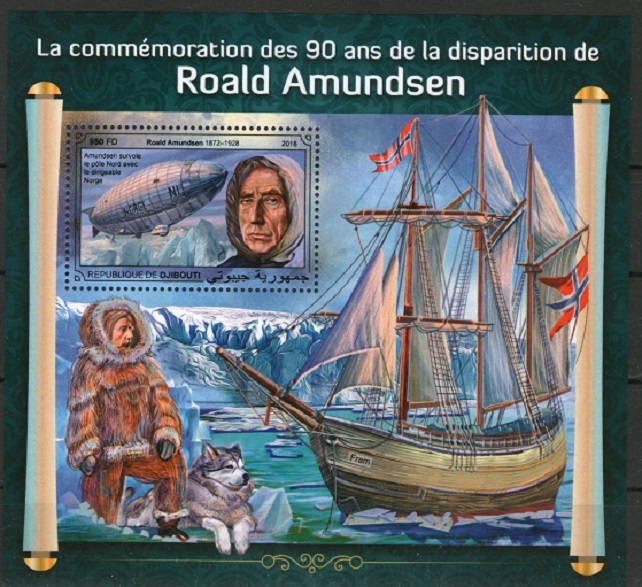 In 1928 Amundsen lost his life in flying to rescue Nobile from a dirigible crash near Spitsbergen. Amundsen's French «Latham 47» flying boat never returned. Later, a wing-float and bottom gasoline tank from the plane, which had been adapted as a replacement wing-float, were found near the Tromsø coast. It is believed that the plane crashed in fog in the Barents Sea, and that Amundsen and his crew were killed in the wreck. 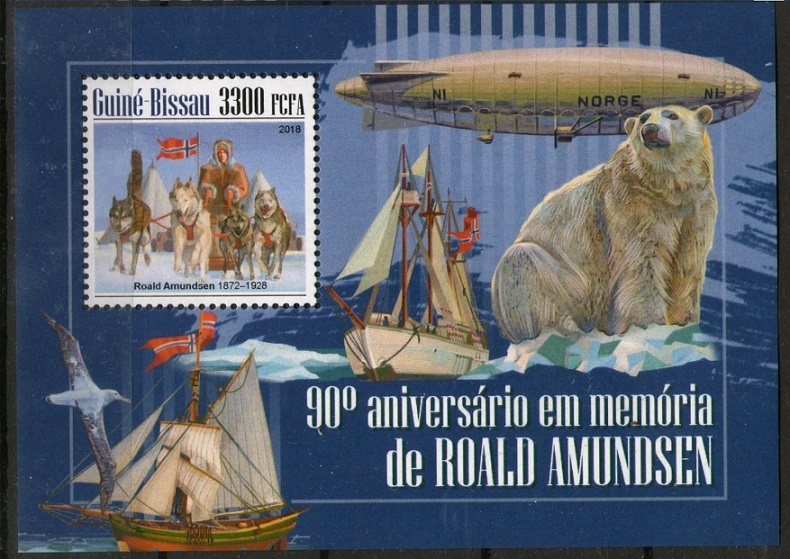 Amundsen’s books include The South Pole (1912) and, with Ellsworth, First Crossing of the Polar Sea(1927). A number of places have been named after Amundsen:The Amundsen–Scott South Pole Station is named jointly with his rival. Amundsen Sea, off the coast of Antarctica. Amundsen Glacier, in Antarctica.Amundsen Bay, in Antarctica and other.